My semester at school just started up on January 23rd and, despite being thrilled to be back, the change in schedule (and routine) has really thrown me for a loop. This semester I have classes five days a week and I’m at the school until just after noon each day. Compared to my three-day school weeks I’ve been used to the last few semesters, I can certainly feel a difference. Going from a month vacation off from school to being at school every weekday is more difficult that I had imagined. First, schedule. Schedule, schedule, schedule. Since getting a smart phone a year ago, I’ve stopped using a paper agenda and instead have been using Google Calendar to keep track of my days. Google Calendar is great for many reasons. I can view, add and edit my calendar via my phone, as well as on any computer connected to the internet. When I enter an event, I can set a reminder to alert me 15 minutes (or other specified time) before the event. I can invite someone to my event by entering their email. This is handy for event’s that a family member or friend should be aware of, for example, a Father-Daughter Dance. I can also share my entire calendar with another Google Calendar user. My partner and I have both shared our calendars with one another. All of my events show up on his calendar coded in a different color then his (and vice versa). This is helpful with kids, as he can see all of the activities and appointments they have scheduled, without my needing to individually invite him to each one. I use Google Calendar in the same manner I used my paper agenda. I write down all of the events that are static (class schedules, dance lessons, swim lessons, etc) and fill in any appointments or other events as I become aware of them. I also block off times for myself to work on homework, when class assignments are due, when I need to pick a child up early, etc. I even use the calendar to remind me of things that need to be done, such as “Clean cat litter” or “Call to make appointment” so I don’t forget. Second, I get as much I can done the night before. We pick out clothes the night before in our house because mornings are hectic enough without worrying what you’re going to wear. And having two daughters only makes that trickier. 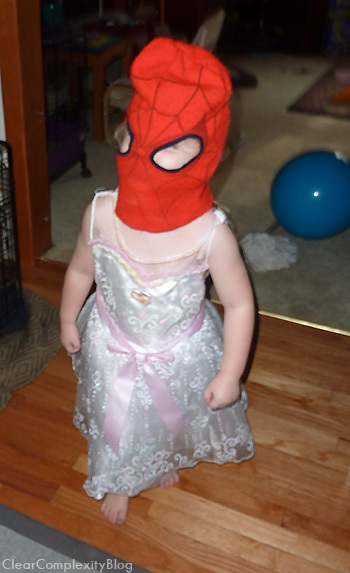 Each of my daughters picks out what they want to wear before going to bed each night. Before I go to bed, I do the same. The rule is that what you pick out, is what you wear. When I started this, I said the rule upfront to both of my daughters. After a week, picking out our clothes the night before started to become part of our daily night-time routine. And it saves SO much time and drama in the morning. Of course, you might end up with this. But remember, what you pick out is what you wear! Anything else that can be anticipated needing to be done for the morning is also done the night before. School lunches are packed and ready to go. Notes, permission slips and the like are signed and filed away into backpacks. Homework is always completed the night before and everything needed for school is packed into backpacks as well. This includes me, as I’ve likely been guilty of forgetting items needed for school more times than my daughter. Yes, I know it seems like it could be categorized under schedule. But, trust me, planning isn’t quite the same thing (though they are intertwined). The number one planning item is meals. After a long day at school/work/activities the last thing anyone wants to do is come up with what to have for dinner. I try to plan out two weeks of meals at a time. I know some people plan out day by day, labeling X meal for Y day, but I can’t see doing it that way. What if I’m not in the mood for what’s planned? It’d very quickly throw the whole plan off. Instead I plan out two weeks of main courses that I can then pick and choose from as I wish. Most of the time this is nothing more than a post it note and a list of meals. 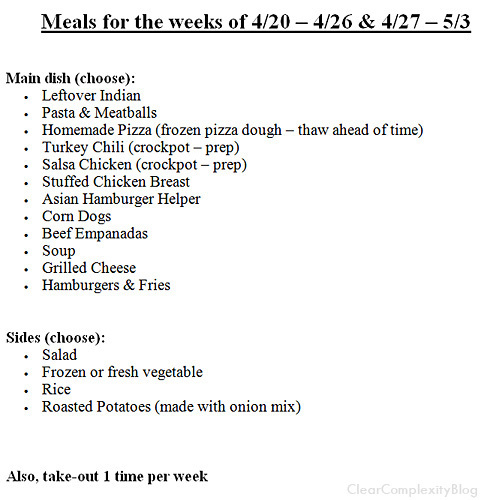 This is an older meal plan. Back from when I still typed and printed them. The one exception is Wednesday, which is our family’s busiest day of the week. On these days I try to plan an easy crockpot meal that I can quickly throw in the crockpot in the morning and come home to a wonderful smelling kitchen in the evening. One of my favorite sites for crockpot recipes is A Year of Slow Cooking, which has some amazing (and easy!) crockpot recipes. I’ll likely go into further depth on my love of crockpot cooking in later posts. Being busy, being a student, being a mom and trying to be it all can be overwhelming. When everything starts to seem like too much, just take a break. Take a moment. Look at the sky. Count to 10. Take some deep breaths. It’s not going to be perfect. Ever. But sometimes all we need is a brief interruption of our steady swimming to stay afloat to realize that our heads our still above water and we can breathe. Obviously this isn’t an exhaustive how-to of juggling busy family life and stress (I didn’t even begin to cover procrastination). But it’s a start. A change of any type will come with some added difficulty in the beginning but, with time and persistence, a new routine can be formed. I know the next few months for me are going to be hectic and trying, filled with difficult courses and my self-imposed pressure to keep my high GPA (and that’s just my school stuff!). My goal throughout it all is to go easier on myself and enjoy the process as much as the outcome. Because it’s the journey that teaches us and inspires growth, not the destination. This entry was posted in Being a Mom, Food, Resources, Skills and tagged children, crockpot, daughter(s), family, just breathe, knowledge, meal planning, parenting, planning, scheduling, school, smart phone, stress, support, tools on February 5, 2012 by Lyndsey.